When I practice my embroidery applique, I use scrap pieces of fabric with iron on interfacing on them. In this project, I used a practice piece I did last year when practicing my satin stitch applique on some accuquilt go hearts. I had one left over that was a basic red medium heart satin stitched in black on a white T-Shirt scrap. I decided I wanted to use this on my mug rug. It's number 1 in the image below. On #2 I cut the heart out of the T-shirt backing and left a little edge of the white T-Shirt. #3. 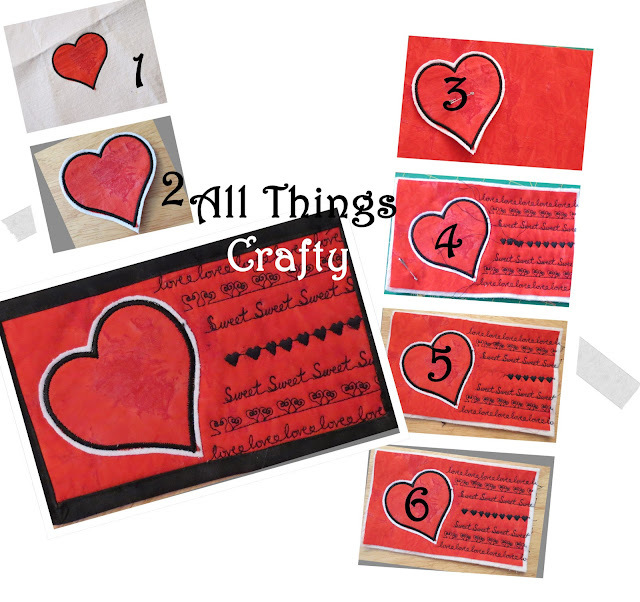 I cut fusible web with my accuquilt go hearts as well and ironed the applique to the scrap piece of red fabric. Make your mug rug whatever size you want. There are no rules. I just happened to have a nice size red scrap. Mine ended up being 7" x 4.5" #4. I decided it was pretty plain so I finally used some of my fancy stitches on my sewing machine. I chose anything heart related and added the words Sweet and Love to the lines as well. I stitched these to the fabric sandwich with batting and backing. As you can see, I really messed up with the stitching of the solid center hearts. On #5, I ripped out 3 hearts and tried again in #6. Looks OK to me. In the last center photo, I added some scrap binding I had. I always make too much and think, save it, some day I'll use it. Yeah, I did! So, if you are looking for a quick project, think maybe a Valentines mug rug and use all those fancy stitches we have on our machines! !